Lawmakers on Capitol Hill have held up California’s new, error-plagued automatic voter registration program as a model for the nation, and are now pushing for a nationalized version of the program in a bill called the For the People Act. The bill would require all states to implement automatic voter registration systems, which advocates claim would improve the accuracy of voter registration rolls, prevent ineligible people from registering, help election officials do less work to keep voter registration records accurate, and make it easier for eligible voters to register or update their registration records. Yet since California started its own automatic voter registration program last April, exactly the opposite has happened. California enacted its law back in 2015 and officially launched the voter registration system in April 2018. That three-year gap should have been plenty of time for state officials to develop a smooth rollout. Then, the program launched in April 2018. By May, a “software error” had affected 77,000 registration records for voters who were already registered, and for many it generated duplicate records. The new system also created confusion for many people at the DMV by posing voter registration questions to everyone automatically—even those who weren’t ready to register or were already registered. So the new system that was supposed to make local election officials’ jobs easier made them harder during a busy pre-election season, and created problems for voters who were already registered to vote. Throughout the summer, the DMV experienced long lines and mounting public pressure due to long wait times. Part of the reason for the longer lines was undoubtedly the new automatic voter registration program. In September, the DMV admitted to having incorrectly registered or entered errors into 23,000 voter registration records. These errors included incorrect party affiliation, language preference, and requests to vote by mail. Around 4,600 of the errors were people who were registered but who did not want to register to vote and did not complete the required voter registration affidavit. DMV officials blamed an “administrative processing error” caused by DMV workers who did not fully clear their screens before serving the next customer. What can those 23,000 people do to correct those errors? They will receive a postcard in the mail and have to correct the errors themselves. So much for making voter registration easier and for leaving alone those who don’t wish to be registered. 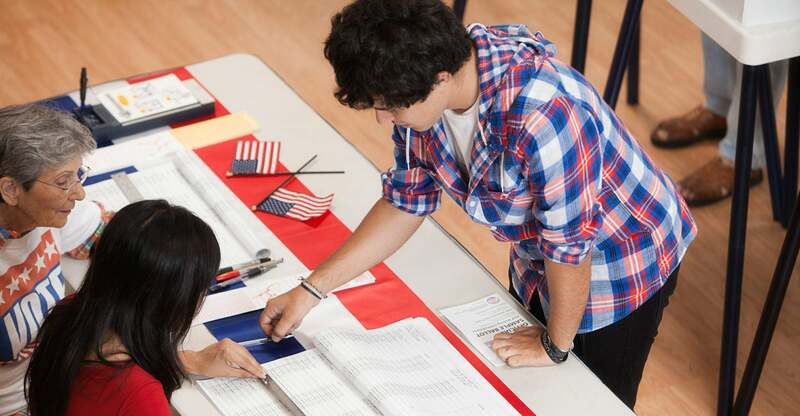 In October, the DMV admitted that an additional 1,500 people who should not have been registered to vote were registered—including noncitizens. The DMV blamed this on employees making data entry errors. This error only came to light when a Canadian citizen with a green card reported to the Los Angeles Times that he had received a voter registration card after a visit to the DMV to update his driver’s license. This error was discovered as mail ballots for the November election were starting to be sent. A barcode on the ballots would supposedly prevent any ineligible vote from being counted. But the secretary of state could not confirmwhether any ineligible voters had already voted in the June primary. Election officials had to cancel the ineligible registrations. So not only did the new system make election officials’ jobs harder, but law-abiding people with green cards were given voter registration cards. And if they voted, they would have been breaking the law, which would make any effort to become citizens more difficult. On the whole, more than 100,000 errors were found to have been created by the automatic voter registration system in the span of just a few months, creating headaches for everyone—for voters who were already registered, for ineligible persons who did not wish to register, and for local election officials. Political scientists say this is likely because people are not thinking about voter registration and political parties when they are at the DMV—they simply want to finish their transaction and leave. After visiting the DMV, one Santa Clara County voter received three mail ballotsfor the November election, even though election officials confirmed he only had one voter registration record. And now, the secretary of state is investigating whether the DMV’s delay in processing 589 voter registrations shortly before the November election resulted in valid votes being rejected or election outcomes being changed. As other states and the Congress consider whether to implement automatic voter registration, California’s experience presents a cautionary tale for what can happen when voter registration is shifted away from election officials, who are the experts in this area, to government bureaucrats, who have other responsibilities. While the California secretary of state has tried to shift blame for all these errors, his office is the one with responsibility for voter registration in California. It was his obligation to ensure, in the two-and-a-half years California officials spent planning the new system, that it would work correctly, protect the accuracy of California’s voter registration records, and not register ineligible persons. He even admitted he considered halting the automatic voter registration system he helped set up. After all, it is easier than ever for eligible Americans to register to vote if they want to. They do not need to be forced to register by government bureaucrats.